At the presence of the Lord of the whole earth." Psalm 97:4-5. Bible writers depict God as showing Himself in different ways. Sometimes He revealed Himself as a person. For example, the LORD, appeared to Abraham as three men (or one of the three) in Genesis 18. The Babylonian king Nebuchadnezzar saw "four men … loose and the form of the fourth is like the Son of God" (Daniel 3:25) when he looked into the fiery furnace into which he had just tossed Shadrach, Meshech and Abednego. "Now Mount Sinai was completely in smoke because the Lord descended upon it in fire. Its smoke ascended like the smoke of a furnace and the whole mountain quaked greatly" - Exodus 19:18. 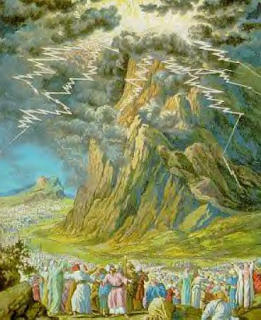 "Now all the people witnessed the thundering, the lightning flashes, the sound of the trumpet, and the mountain smoking' and when the people saw it, they trembled and stood afar off" - Exodus 20:18. My Bible's notes on Psalm 97:4-5 suggest that the images in this psalm are taken from that incident. The writer of the NT book of Hebrews reflects on the reaction of the Israelites to seeing God this way: "… so terrifying was the sight that Moses said, 'I am exceeding afraid and trembling'" - Hebrews 12:21. Then Hebrews goes on to explain how we who live after Jesus come, not to that terrifying mountain but to Jesus the "Mediator of the new covenant" - Hebrews 12:24. We know that we can now come to God without fear. But perhaps we now often come too casually with the attitude that He is our buddy and altogether like us. Perhaps a more realistic stance would be to remind ourselves, when we come running to God, or sitting, or kneeling in His presence that He is also the God of Mount Sinai's smoke, earthquake, lightning flashes and trumpet blasts. PRAYER: Dear God, my mind can never grasp the whole of You. Help me to approach You realistically, with the abandon of a child combined with the fear and respect of a creature approaching its creator. Amen.